The historic “Advanced Jumbo” joins the Epiphone Masterbilt Family! Epiphone continues its historic Masterbilt series with the new Epiphone Masterbilt 2015 AJ-45ME Acoustic/Electric. The legendary J-45 round shoulder dreadnought has been the driving power behind decades of classics in every genre--rock, pop, and country. From Hank Williams to John Lennon the “J-45” has been the go-to guitar for songwriters and rhythm guitarists. Epiphone’s first Ltd. Ed. reissue of the "The Workhorse" J-45 earned it a “Mark of Excellence Award” from Guitar One magazine and now the new Masterbilt 2015 AJ-45ME Acoustic/Electric brings two legends together for the first time! First released in June 1931, the original line of Epiphone Masterbilt guitars made a big impression on musicians and heralded the first great era of acoustic guitars. Today, the new line of Epiphone Masterbilt instruments continues that reputation around the world. The original Epiphone Masterbilt catalog made the promise: "The possessor of an EPIPHONE instrument has the assurance that every possible precaution has been taken to build instruments for lifetime performance and pleasure." And Epiphone still stands by that promise today! The new Masterbilt 2015 AJ-45ME Acoustic/Electric is an ALL SOLID WOOD instrument featuring a solid Sitka Spruce top finished in a Vintage Sunburst Satin finish. The top is supported by hand-scalloped Sitka Spruce braces along with a bone saddle. One of the great attributes of a Sitka Spruce top is that it gets better with age--and playing time--so play your AJ-45ME a lot! The 2015 AJ-45ME’s historic sloped jumbo shape contributes to the guitar’s mighty tone, booming bass, and mid-range projection. The bridge features a vintage classic 1.69” bone nut and the top has 5-ply binding and a tortoise style pickguard. The Masterbilt 2015 AJ-45ME has solid Mahogany back and sides, just like revered vintage models. The hand-shaped neck is also made from solid mahogany with a 1-piece heel. The neck is attached to the body with a dovetail joint and hide glue, and the neck has a standard 24.75” scale. 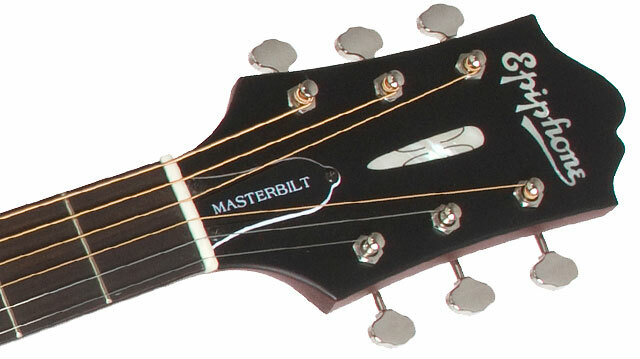 Like all Masterbilts, the neck has a classic SlimTaperTM D profile. 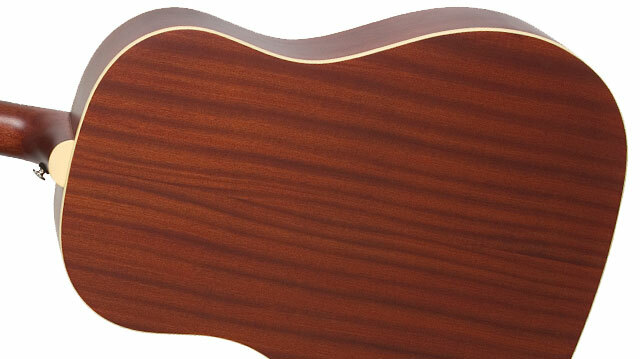 The fingerboard features pearloid dot inlays, a 14” radius, and 20 medium jumbo frets. While the 2015 AJ-45ME sounds great "unplugged," it really comes alive when plugged-in, thanks to Shadow's state-of-the-art Sonic™ preamp system with the revolutionary under-saddle NanoFlex™ low-impedance pickup. Discretely mounted inside the sound hole, the Sonic preamp features an easy-access volume control with Treble and Bass EQ controls. There's also a "phase" switch that instantly cuts feedback without affecting tone. 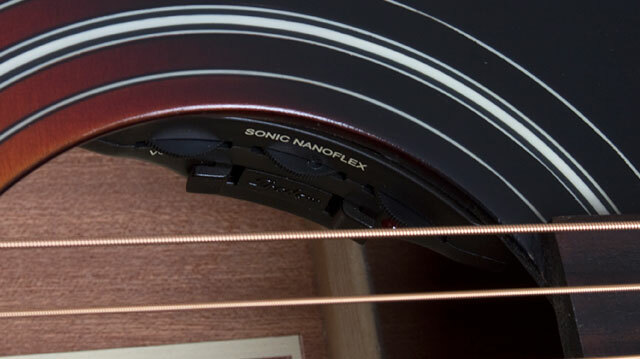 The NanoFlex™ pickup is the only pickup that senses both the vibrations of the strings and the movements of the soundboard simultaneously. So, the sound is truly "acoustic," combining accurate body and string tone with percussive attack. It's like having a microphone mixed with an under-saddle pickup! Due to active amplification directly at the pickup and 100% shielding of the entire system, there is no signal loss and no "hum" created. A battery indicator LED turns on when the battery is low and should be replaced within 30 minutes. The preamp is powered by two 2032 lithium, 3V batteries and the complete system is extremely light and weighs far less than ordinary 9V systems. A premium Shadow output jack is incorporated into the endpin jack, and the entire electronic system is covered by Shadow's 5-year worldwide parts and labor limited warranty. The Epiphone Masterbilt 2015 AJ-45ME Acoustic/Electric features Epiphone’s quality nickel hardware and stays in-tune thanks to world famous Grover™ Sta-Tite™ machine heads with a pro-level 18:1 tuning ratio.